This is also called “Jumpers Knee” and occurs because of inflammation at the upper part of the patellar tendon or at the attachment to the tibia (rare unless Osgood-Schlatters). 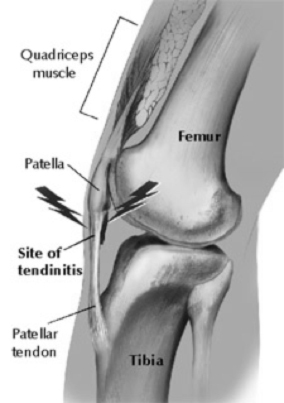 Pain is similar to anterior knee pain and it can be quite disabling with sports. Treatment is with physiotherapy, alteration of activity, ECWST and occasionally injection of steriods (very carefully). If all else fails surgery can be quite successful in curing the condition.